Five states in four days, two National Parks, hundreds of miles, one high school graduation ceremony, family picnic, dog walks, conversations, toddler laughing and crying, one sunburned shoulder, etc. When I close my eyes, I still see pavement swooping ahead of me: solid white line on the right, dashed yellow line on the left. Valleys and mountains, basin and range, massive deep blue-gray clouds forking down lightning, silver sweeps of virga, thunderous rain. 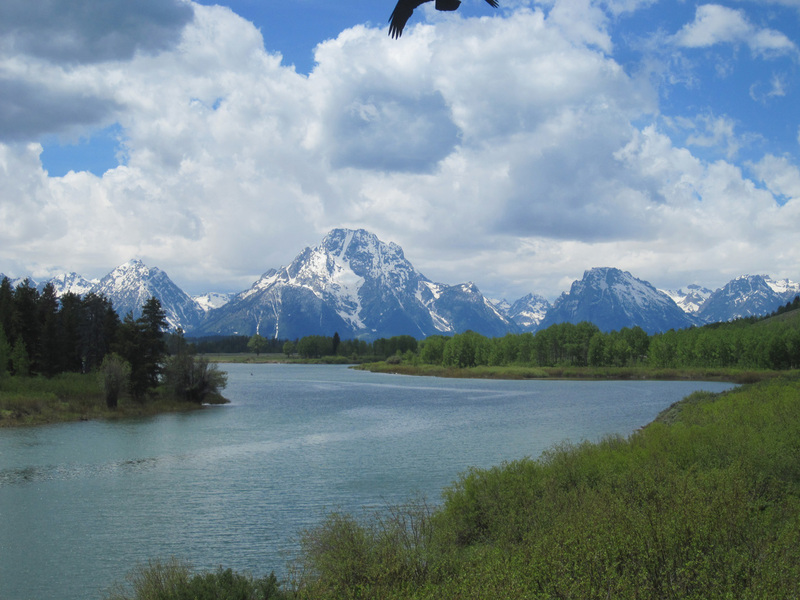 My mom, niece Tessa, and I came north through the Tetons and Yellowstone in a day. I longed to jerk the car to the shoulder and tumble out the door with backpack and sketchbook to disappear into the incredible landscape. But it was not that kind of trip. I maintained my mature adult posture and stayed on the road. Snow is melting off the Continental Divide, leaving water in ditches where yellow glacier lilies tilt their pointed caps. Just like here. A cow elk bounded across the road in a smooth rhapsody of hooves and fur. Just like here. We stopped to pay homage to Old Faithful, accepting our role as tourists. With hundreds of other humans, we waited in a reverent semi-circle for this wonder of the world. Wind blew the constant plume of steam this way and that. A few smaller gushes, then the fountain rising up. “Aaahh,” went the crowd. I was surprised at all of us. People were taking photos, but most were just watching, completely present to nature’s spectacle. No side conversations, no texting (maybe there was no cell service), no displays of irritating primate behavior that I observed. The geyser receded back to its plume of steam, and folks dispersed. The famous stuff is famous for a reason, but I am also fascinated by the smaller features. My grasp of Yellowstone geology is pretty rudimentary, so I’m content to revert to a child-like sense of wonder. How can this water be hot? How can it be this color? How can any plants grow here? What if the volcano under this place blew up right now? Tess and I consider the example of Pompeii. The gases would kill us, and there would be nothing we could do. Oh, well. I really wanted to stop at the Artist Paint Pots, where I had field-sketched with a workshop in 1998. Since then, the Park Service has developed a trail through the area. Fourteen years ago I sat on rocks with my watercolors, and felt the earth’s heat as I painted. Not possible to do that now. 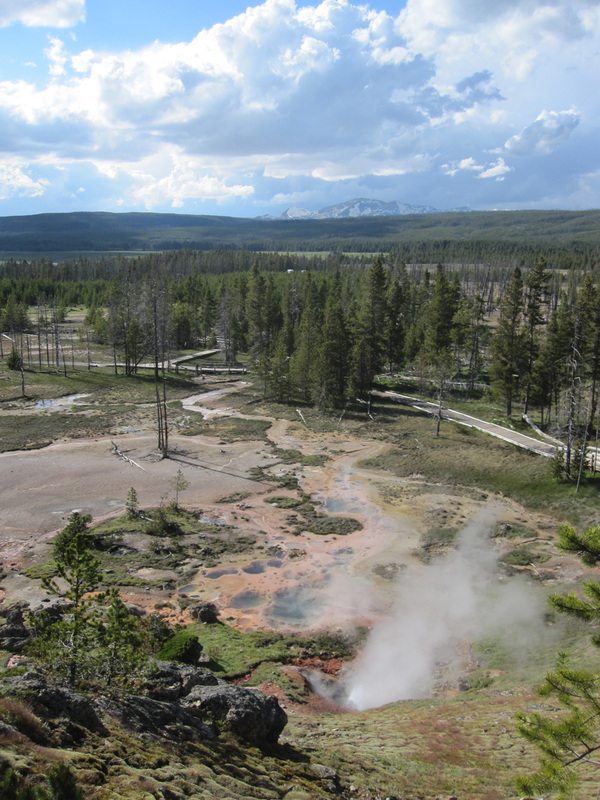 The trail and boardwalks are there to protect the fragile thermal areas. The Park Service doesn’t mess around. When they build a trail, it stays built…unlike some of the tenuous narrow dirt paths the Forest Service tries to maintain in remote wilderness areas. As a dedicated student of wildfire, I was curious to see how the forest has grown. Fires swept through Yellowstone in 1988, creating a political uproar about fire management. When I visited the park in 1998, there were many silver snags–standing dead trees–and a green fuzz of baby pines coated the hills. Now the pines are taller and thick. Most of the snags have fallen. Burned stumps are still visible, but the overwhelming impression is of green growth. Stopping by a young lodgepole pine, I showed my mom the two different kinds of cones. This species is adapted to stand-replacing wildfires. It produces seed-bearing cones each year, but huddled back on the branches are tight serotinous cones that stay tight until the heat of a fire releases them onto the new scorched seed bed. 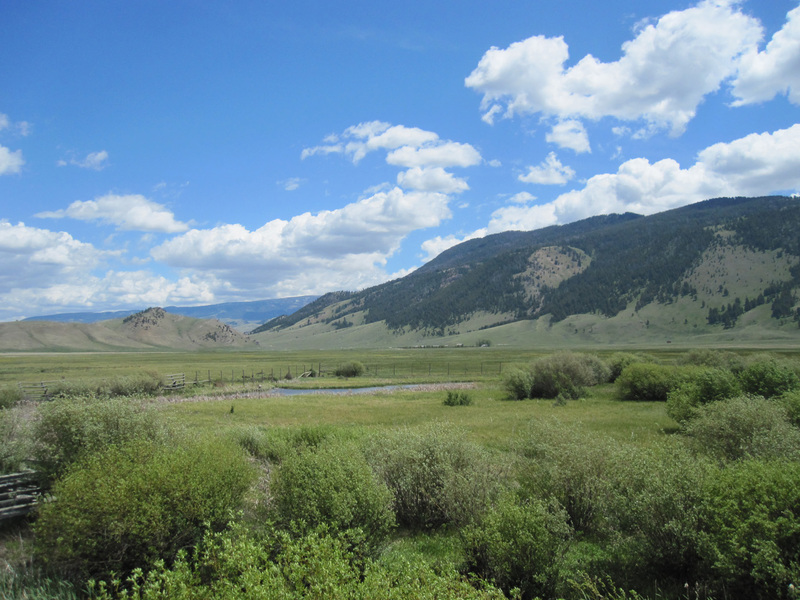 Lodgepole pine (Pinus contorta) is a pioneer species, loving the sun of open disturbed areas and growing quickly. They can bear cones as early as ten years of age. 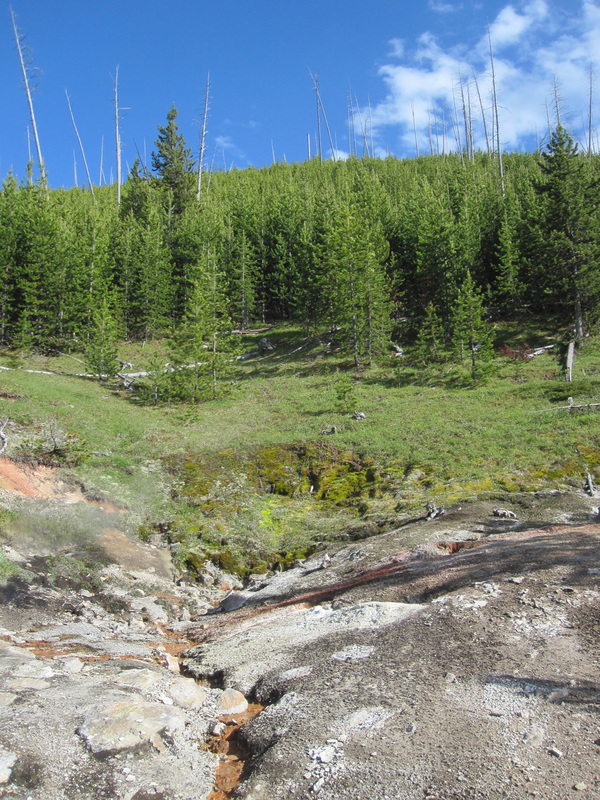 Throughout much of the West, lodgepole pines are relatively short-lived, although on the cold dry Yellowstone Plateau they can live up to 300 years (Stephen Arno, Northwest Trees, 2007). At the entrance booth to the park, every visitor is handed a flyer showing a person being launched into the air by a bison. Wildlife is dangerous and should not be approached. Bison can run faster than you think (up to 35 mph), and are unpredictable. We were glad to see them and photograph them, but had no wish to get close. I marvel at how still they can stand while cars come and go. What goes through their bisonine minds? No clue, although they appear to be meditating peacefully in their raggedy winter-to summer coats. 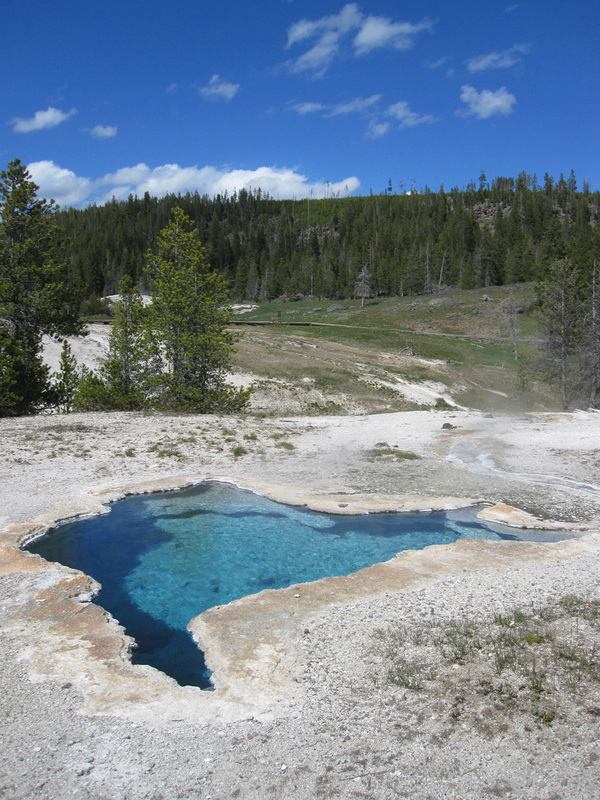 Descending the plateau from Mammoth Hot Springs was like leaving Shangri-la. We followed the Gallatin River north through a line of thunderstorms to find a place to eat and rest in Livingston, Montana. Another long day of driving brought us back to Washington. A day of re-entry is necessary. Remembering how to hold still here at my scruffy little house and overgrown garden…tomorrow I’ll throw on my pack and go to the woods. But not today. Going out and coming back is not to be taken lightly. We may live in a world of technology and speed, but bodies and minds are still wired to travel on foot and sleep on the ground. At least mine are. I’m a little disoriented. Give me time to process my travels, and time to be where I find myself…home. 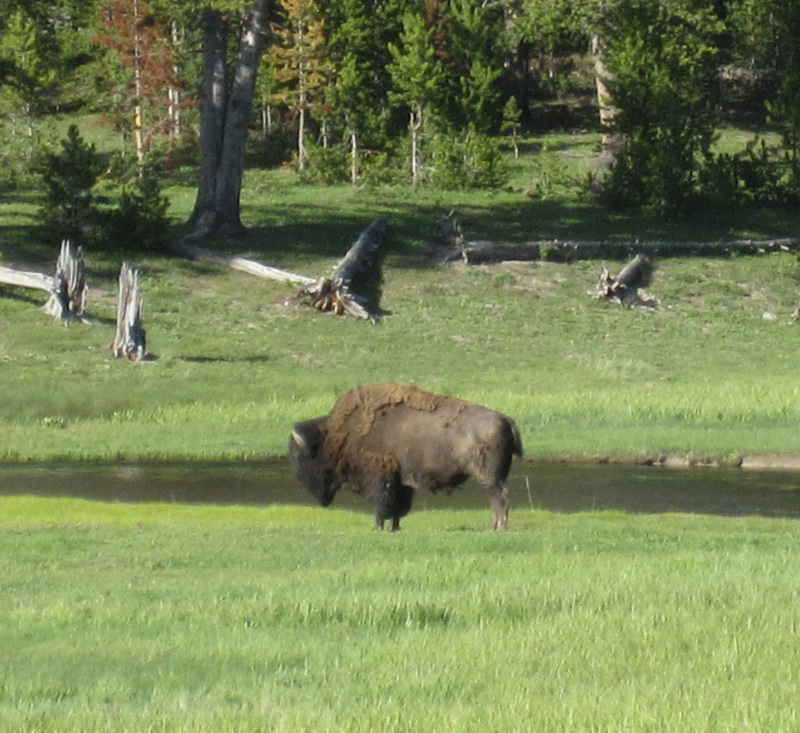 I love the clarity of your pictures – especially the rough and woolly bison! It was an exceptional trip with wonderful company – both going and coming home! And it was great to have the family together for some “private” time.The only thing missing in the whole trip was the brother and his family, but it’s hard to get everybody together these days! Thanks for going with me, Deb!